I never did monthly empties posts because I never had the patience to save the empty jars and bottles to photograph them. Once I finished something I discard it immediately to keep the clutter off. And once I forget, it stays there forever! So I embarked on this journey of using Cruelty-Free products. Since I already had switched to Cruelty-Free skincare, I have started discarding Non-Cruelty-Free Makeup. I decided to compile them into Project Pan List and listing down as how I am replacing Non-Cruelty-Free Products with Cruelty-Free ones. 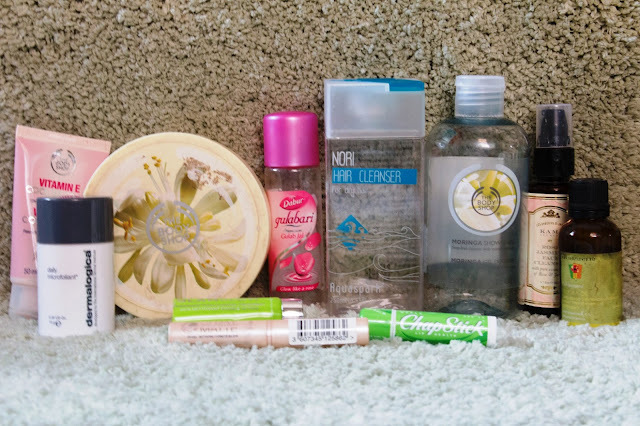 So here is the list of Products I emptied from October 1st to October 25th. I am also discarding stuff I have barely used or disliked. I have reviewed this here. And I have liked it too except that my hair takes a lot of time to adapt to it. That makes me difficult to heat style my Hair. I bought two Soulflower bars that would last me entire 2016. I may repurchase this. But I have shampoo bars and SLS Free Shampoos that will last me long. The Nature's Co is Cruelty-Free. Check the full review here. I finished this in the first week of October and I switched to Grace Cole Indulgent Foam. The Body Shop Moringa Shower Gel was my Cruelty-Free replacement for my all time summer fave Dove Green Tea and Cucumber Bodywash/soap. But did I like it more than Dove? No. I will not repurchase this. I will switch to Lotus Licorice Bar till the end of 2015. I used this up in 19 days! I opened this up on the first of October and on 19th, I was sad. I used this twice a day and this foamed very well. After looking at the Ingredient list, I was taken back with the second ingredient: Sodium Lauroyl Sarcosinate, assuming it same as SLS. But an in-depth reading makes me conclude that Sodium Lauroyl Sarcosinate is the mildest form of foam booster. There are Nitrosamine contamination concerns with Sodium Lauroyl Sarcosinate, is carcinogenic as well. To refer, The Handbook of Green Chemicals by Michael Ash has listed Sodium Lauroyl Sarcosinate as Green chemical. I may repurchase this or other variants from Kama Ayurveda once I finish Cetaphil Cleansing Bar, Melawash and Himalaya Aloe vera Facewash. I disliked this from the very first use. It just didn’t work for my Normal-Combination skin. I tried this in every season hoping it might just work. I did use this instead of moisturiser when I ran out of my regular moisturiser, couple of times. It made me look 3 times dark, I assume it is due to either undertone or skin type. It does work well with my neck but refuses to look good on my face. I gave up, there is 80% of the product left and has dissipated too. Never Repurchase. I dislike BB, CC or ZZ creams altogether. I don’t like samples for the reason I can never make up my mind with a single use. I’m too fickle and there are very few products that work amazingly from the first use. This did deep clean with no breakouts post usage. The texture is unique with clay based mask with little granules. The mask is required to keep on for 20 minutes. You can see it transform into oil after massaging on dampened face. This hydrates well and it did bring a glow. This lasted me two uses but Glamglow is not Cruelty-Free. I bought this on impulse for covering Acne and blemishes. This never blended well, it either balled up or smudged and transferred on my phone. And yes, it did accentuate my flaking blemishes during the healing period. In all, total waste of my money though it is cheap. Carmex were the only Lip moisturizers I went through quickly. I love Carmex and Chapstick too. I finished this up in 6 months alternating with EOS sweet mint. I have either Cherry or Strawberry left. I use Chapstick before applying my Matte lipsticks and it hydrates well without drying. I may not repurchase Chapstick but I am stocking up on Carmex. At first, I was unsure if this would work great for me. I do not use granular scrubs since it aggravates pigmentation. It has been over a year, I haven’t used one. Yes, I Love this and I will be repurchasing this later in 2016. Rose water and Soulflower Jojoba Oil are an essential part of my skincare routine. Apart from these, I finished up all the Skincare samples from Sephora. There are few more products lined up that I will be discarding. I am so spaced out right now!